The White House is the residence and official office of the president of the United States. 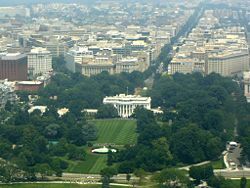 The White House is located on 18 acres of land at 1600 Pennsylvania Avenue N.W. in Washington, D.C. Every president with the exception of George Washington has served the country from this location. Washington, America's first president, resided in New York and Philadelphia (1789-1797). The White House was originally known as the "Presidents Palace," was changed to Executive Mansion (1810-1902) due to the desire to have no confusion with royalty. The building was named the “White House” by Teddy Roosevelt (1901-1909). It is the nation's capitol oldest most historic building. 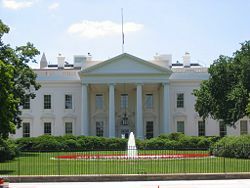 The White House is well known throughout the world as a symbol of American democracy. It is both loved and hated; those who admire the values embodied by the United States Constitution see the White House as an emblem of freedom, democracy and human rights, even of the American manifest destiny. Those who accuse the United States of double standards—of upholding freedoms at home while often propping up totalitarian regimes elsewhere or intervening in the affairs of sovereign states—see the White House as a place of hypocrisy, even as a threat to world peace. For millions of Americans, however, its functionality and its comparatively modest yet imposing structure represent ideals that stand at the center of American identity, especially perhaps that a person of the humblest origin can rise to be president but that unlike kings or emperors, his or her power is limited as are the terms of his or her office. Washington, D.C. was formed from land ceded by two states—Virginia and Maryland. Both transferred ownership of the land to the federal government in response to a compromise with President Washington. The District of Columbia commissioners were charged by Congress with building the new city under the direction of the president. The architect was chosen in a competition, which received nine proposals. President Washington traveled to the site of the new federal city on July 16, 1792 to make his judgment. His review is recorded as being brief; he quickly selected the submission of James Hoban, an Irishman living in Charlestown, South Carolina. The briefness of Washington's review of the plans may have been due to the majority of the submissions being awkward and naïve. Washington was not entirely pleased with the original Hoban submission. He found it too small, lacking ornament, and not fitting for the nation's president. On Washington's recommendation, the house was enlarged by 30 percent and a large reception hall, the present East Room, was added. This was likely inspired by the large reception room at Mount Vernon. 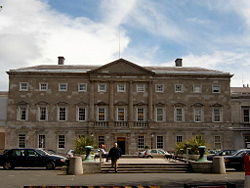 The building Hoban designed was largely modeled on the first and second floors of Leinster House, a ducal palace in Dublin, Ireland, which is now the seat of the Irish Parliament. Construction began with the laying of the cornerstone on October 13, 1792. While the White House remains a continuing symbol of American democracy, the house also reflects the nation's early involvement with the institution of slavery. A diary kept by the District of Columbia building commissioner records that the footings for the main residence were dug by slaves. The foundations were also built by slave labor. Much of the other work on the house was performed by immigrants, many of whom were yet without citizenship. The sandstone walls were erected by Scottish immigrants, as were the high relief rose and garland decorations above the north entrance and the "fish scale" pattern beneath the pediments of the window hoods. Much of the brick and plaster work was produced by Irish and Italian immigrants. The porous sandstone walls were coated with a mixture of rice glue, casein, and lead, giving the house its familiar color and name. The building was originally referred to as the "Presidential Mansion" or "President's House." Dolley Madison, first lady and wife of James Madison, called it the "President's Castle." The earliest evidence of the public calling it the "White House" was recorded in 1811 due to its white-painted stone exterior. The name "Executive Mansion" was often used in official context until President Theodore Roosevelt established the formal name by having the de facto name "White House–Washington" engraved on the stationery in 1901. President Franklin Delano Roosevelt changed his letterhead to "The White House" with the word "Washington" centered beneath, a convention that remains today. The White House from the South Lawn, showing the columned South Portico. The South Portico was constructed in 1829 based on earlier drawings by Hoban. The second floor balcony, known as the Truman Balcony, was added in 1947. Welcome ceremonies for visiting heads of state take place on the South Lawn. Marine One, the president's helicopter service, lands and departs from the South Lawn. Construction of the White House was completed on November 1, 1800. Over an extremely long period of eight years of construction, $232,371.83 was spent. This would be approximately equivalent to $2.4 million today (recalculated for recent inflation). The north portico was built in 1824, and though architect Benjamin Henry Latrobe proposed similar porticos during the rebuilding after the fire in 1814, both porticos were designed by Hoban. Contrary to a frequently published myth, the north portico was not modeled on a similar portico on another Dublin building, the Viceregal Lodge (now Áras an Uachtaráin, residence of the president of Ireland). Its portico in fact postdates the White House porticos' design. The south portico was built in 1829. The decorative stonework on both porticos was carved by Italian artisans brought to Washington to help in constructing the U.S. Capitol. Franklin Delano Roosevelt had Adams' blessing carved into the mantel in the State Dining Room. In 1814, during the War of 1812, much of Washington was burned by British troops in retaliation for burning Upper Canada's Parliament Buildings in the Battle of York (present day Toronto), leaving the White House gutted. Only the exterior walls remained. A legend merged that during the rebuilding of the structure white paint was applied to mask the burn damage it had suffered, giving the building its namesake hue. This is unfounded as the building had been painted white since its construction in 1798. Of the numerous spoils taken from the White House when it was ransacked by British troops, only two have been recovered—a painting of George Washington, rescued by then-first lady Dolley Madison, and a jewelry box returned to President Franklin Delano Roosevelt in 1939 by a Canadian man who said his grandfather had taken it from Washington. Most of the spoils were lost when a convoy of British ships led by HMS Fantome sank en route to Halifax off the south shore of Nova Scotia during a storm on the night of November 24, 1814. The White House was attacked again on August 16, 1841, when U.S. President John Tyler vetoed a bill which called for the reestablishment of the Second Bank of the United States. Enraged Whig Party members rioted outside the White House in what was the most violent demonstration on White House grounds in U.S. history. Jefferson's West Colonnade is seen on the left of the residence in this nineteenth-century engraved view. The West Colonnade originally concealed a stable and laundry room. Later it became the site of Franklin Roosevelt's swimming pool. President Nixon converted the space to the current Press Briefing Room. Like the English and Irish country houses it resembled, the White House was remarkably open to the public until the early part of the twentieth century. President Thomas Jefferson held an open house for his second inaugural in 1805, when many of the people at his swearing-in ceremony at the Capitol followed him home, where he greeted them in the Blue Room. Those open houses sometimes became rowdy: in 1829, President Andrew Jackson had to leave for a hotel when roughly 20,000 citizens celebrated his inauguration inside the White House. His aides ultimately had to lure the mob outside with washtubs filled with a potent cocktail of orange juice and whiskey. Even so, the practice continued until 1885, when newly elected Grover Cleveland arranged for a presidential review of the troops from a grandstand in front of the White House instead of the traditional open house. Jefferson also permitted public tours of his home, which have continued ever since, except during wartime, and began the tradition of annual receptions on New Year's Day and on the Fourth of July. Those receptions ended in the early 1930s. The White House remained accessible in other ways as well; President Abraham Lincoln complained that he was constantly beleaguered by job seekers waiting to ask him for political appointments or other favors, or eccentric dispensers of advice like "General" Daniel Pratt, as he began the business day. Lincoln put up with the annoyance rather than risk alienating some associate or friend of a powerful politician or opinion maker. During most of George W. Bush's presidency, the White House was closed to visitors because of terrorism concerns. 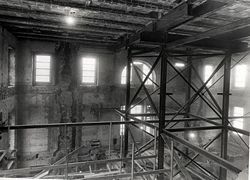 Truman reconstruction, 1949-1952 — First the interior rooms were dismantled and stored, then within the original walls a steel and concrete structure was erected. The interior rooms, with most of the original trim and floor boards, were rebuilt within the new framework. Two colonnades, one on the east and the west, were designed by Jefferson connect the residence to the West Wing and the East Wing. The residence houses the president's home, and rooms for ceremonies and official entertaining. The State Floor of the residence building includes the East Room, Green Room, Blue Room, Red Room and State Dining Room. The third floor family residence includes the Yellow Oval Room, East and West Sitting Halls, the president's dining room, the Treaty Room, Lincoln Bedroom and Quenns Bedroom. 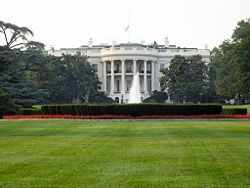 Few people realize the size of the White House, since much of it is below ground or otherwise minimized by landscaping. The White House includes six stories and 55,000 square feet (5,100 square meters) of floor space, 132 rooms and 35 bathrooms, 412 doors, 147 windows, eight fireplaces, eight staircases, three elevators, five full-time chefs, , a tennis court, bowling alley, movie theater, jogging track, swimming pool, putting green, and five thousand visitors per day. Decades of poor maintenance and the construction of a fourth story attic during the Coolidge administration took a great toll on the brick and sandstone structure built around a timber frame. By 1948 the house had became so unsound that President Truman abandoned it, moving across the street to Blair House, from 1949-1951. The reconstruction required the complete dismantling of the interior spaces, construction of a new load-bearing internal steel frame and the reconstruction of the original rooms within the new structure. Some modifications to the floorplan were made, the largest being the repositioning of the grand staircase to open into the Entrance Hall, rather than the Cross Hall. Central air-conditioning was added as well as two additional sub-basements providing space for workrooms, storage, and a Cold War-era bomb shelter. The president and Mrs. Truman and their daughter Margaret moved back into the White House on March 27, 1952. While the house was saved by the Truman reconstruction, much of the new interior finishes were generic and of little historic value. Much of the original plasterwork, some dating to the 1814-1816, rebuilding was too damaged to reinstall, as was the original robust Beaux Arts paneling in the East Room. President Truman had the original timber frame sawed into paneling. The walls of the Vermeil Room, library, China Room, and map room on the ground floor of the main residence were paneled in wood from the timbers. Jacqueline Kennedy Onassis, wife of President John F. Kennedy (1961–1963), directed the most extensive and historic redecoration of the house in its history. Many antiques, fine paintings, and other improvements of the Kennedy period were donated to the White House by affluent donors, including the Crowninshield family, Jane Engelhard, Jayne Wrightsman, and the Oppenheimer family. The first White House guide book was produced with direct supervision from Jacqueline Kennedy. Sale of the guide book helped finance the restoration. The Kennedys’ Fine Arts Committee eventually became the congressionally-authorized Committee for the Preservation of the White House, whose mission is to maintain the historical integrity of the White House. The committee works with the first family, usually represented by the first lady, the White House curator, the chief usher of the White House, and the White House curator of fine arts. Since the committee's establishment, every presidential family has made some changes to the family quarters of the White House, but changes to the state rooms must all be approved by the Committee for the Preservation of the White House. During the Nixon administration, first lady Pat Nixon refurbished the Green Room, Blue Room and Red Room, working with Clement Conger, the curator they appointed. In the 1990s, President and Mrs. Clinton had some of the rooms refurbished by Arkansas decorator Kaki Hockersmith. 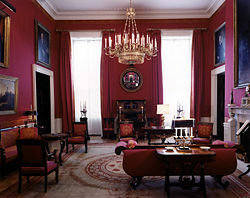 During the Clinton administration, the East Room, Blue Room, State Dining Room and Lincoln Sitting Room were refurbished. More recently, a refurbishing of the Lincoln Bedroom begun during the Clinton administration was completed, and the refurbishment of the Green Room and East Room has begun. The White House is one of the first government buildings in Washington that was made wheelchair-accessible, with modifications having been made during the presidency of Franklin Delano Roosevelt, who needed to use a wheelchair as a result of his polio. Further improvements were made during the 1990s to ensure access for wheelchairs. In the early twentieth century, new buildings were added to the colonnades at either side of the main White House to accommodate the president's growing staff. The West Wing houses the president's office (the Oval Office) and offices of his senior staff, with room for about 50 employees. It also includes the Cabinet Room, where the United States Cabinet meets and the White House Situation Room. This portion of the building was used as the setting for the popular television show The West Wing. Some members of the president's staff are located in the adjacent Old Executive Office Building in the former State War and Navy Building, sometimes known as the Eisenhower Executive Office Building. The East Wing, which contains additional office space, was added to the White House in 1942. The East Wing was built during World War II in order to hide the construction of an underground bunker to be used in emergency situations. The bunker has come to be known as the Presidential Emergency Operations Center. Jefferson drafted a planting plan for the North lawn that included large trees that would have mostly obscured the house from Pennsylvania Avenue. During the mid- to late-nineteenth century a series of ever larger greenhouses were built on the west side of the house, where the current West Wing is located. During this period the north lawn was planted with ornate "carpet style" flower beds. Although the White House grounds have had many gardeners through their history, the general design, still largely used as masterplan today, was designed in 1935 by Frederick Law Olmsted, Jr. of the Olmsted Brothers firm, under commission from President Franklin D. Roosevelt. During the Kennedy administration the Rose Garden was redesigned by Rachel Lambert Mellon. On the weekend of June 23, 2006, a century-old elm tree on the north side of the building came down in a rainy and windy storm. This elm is depicted on the right side on the back of the $20 bill. This tree was believed to have been planted between 1902 and 1906 during Theodore Roosevelt's administration. Among the oldest trees on the grounds are several magnolias (Magnolia grandiflora) planted by Andrew Jackson. 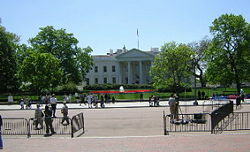 On May 20, 1995, primarily as a response to the Oklahoma City bombing of April 19, 1995, but also in reaction to several other incidents, (see Security Review) the United States Secret Service closed off Pennsylvania Avenue to vehicular traffic in front of the White House from the eastern edge of Lafayette Park to 17th Street. Later, the closure was extended an additional block to the east to 15th Street, and East Executive Drive, a small street between the White House and the Treasury Building was closed to the public. Public tours were suspended in the wake of the events of September 11, 2001. The White House is protected by the United States Secret Service. The official White House website is www.whitehouse.gov. It was established on October 17, 1994, during President Clinton's administration. The first White House site is archived here and the second here. ↑ White House Facts, WhiteHouse.gov. Retrieved June 28, 2007. Encyclopædia Britannica. 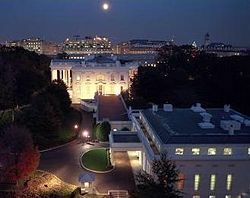 “White House.” Encyclopædia Britannica Online Library Edition, 2007. Wolff, Perry. A Tour of the White House with Mrs. John F. Kennedy. New York: Doubleday & Company, 1962. Exhibition Catalogue, Sale 6834: The Estate of Jacqueline Kennedy Onassis April 23-26, 1996. Sothebys, Inc, 1996. The White House: An Historic Guide. Washington, DC: White House Historical Association and the National Geographic Society, 2001. ISBN 0912308796. This page was last modified on 7 August 2013, at 16:27.